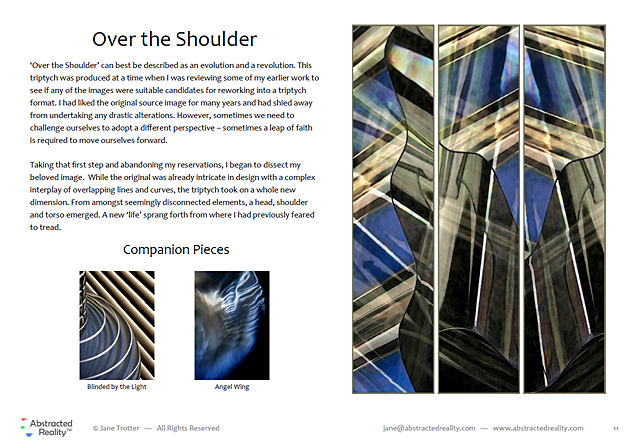 Interior Designers Get the Abstracted Reality Contemporary Abstract Art catalogue! I would love to work with you on your interior design plan and have prepared a catalogue specifically tailored to the needs of professional Interior Designers and Art Consultants. Abstracted Reality's 'Contemporary Abstract Art' catalogue is a one stop shop for all of your design and presentation needs. Answering many of the questions you and your clients may have, the catalogue also contains dedicated pages for each image, making it very easy to view and select which artwork best suits the interior you want to create. I look forward to collaborating with you on your projects. ‘Abstracted Reality’ brings a new and exciting dimension to abstract imagery. Whether your clients want to bring refinement and sophistication to a room, establish a feeling of expansiveness, inspire creativity or instil a sense of calmness and serenity, my fine art prints have the right colours, contours and graphic design elements to create the perfect mood and tone, and will suit any number of interiors. 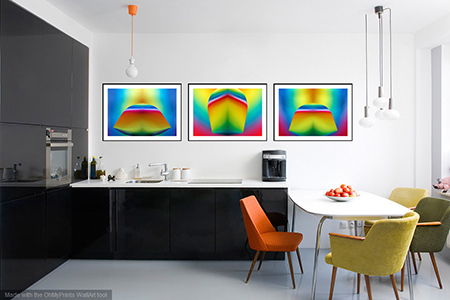 With a range of print sizes available, my fine art prints will help you to create an exciting and extra-ordinary interior design plan, delivering unique artwork which will enliven, inspire and bring your design visions to life. I know how important it is for you to present a professional appearance, meet deadlines and budgets, and manage your business successfully. That’s why I’m committed to providing you with the professional services you require – accessibility, flexibility, a prompt and reliable turnaround, a readiness to listen and a willingness to go the extra mile! If you want something to look through with your clients and perhaps leave with them to mull over, Abstracted Reality’s ‘Contemporary Abstract Art’ catalogue contains all the information you and your clients will need. Selecting several abstract artworks to grace your clients’ interiors has never been easier. My images have been carefully chosen to all have ‘companion pieces’ - other images which will work in harmony and tastefully complement each other. 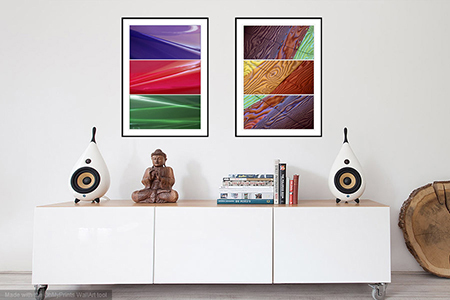 It is very easy to select and create an eye-catching ‘Abstracted Reality’ collection. 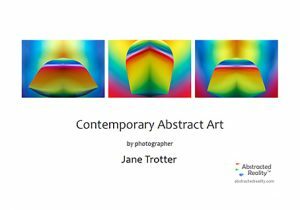 To assist with the selection process, you will find suggested ‘companion pieces’ on each image’s feature page in the ‘Contemporary Abstract Art’ catalogue. I have chosen and crafted my images with several features in mind, all designed to help you and your client achieve the perfect look for their interior. Flexibility of Size: Prints come in a range of standard sizes, but feel free to discuss specific size requirements. A consistent look and style means that multiple placements along a corridor or in a board room have an uninterrupted visual flow. Flexibility of Substrates: I am happy to explore other substrate options with you. 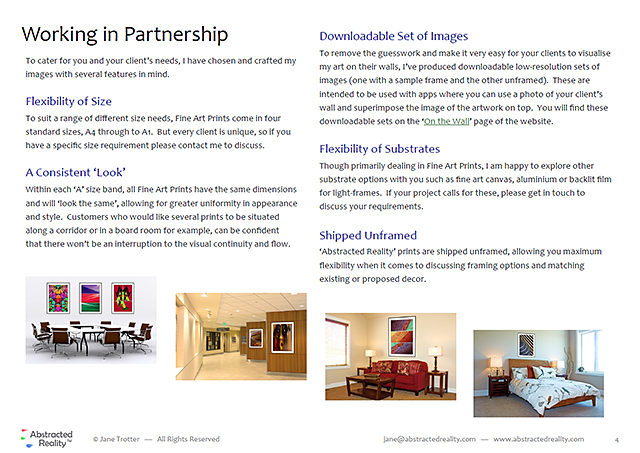 Abstracted Reality Prints are shipped unframed so you can choose framing that matches existing or proposed decor. Limited Edition's are hand signed, numbered and accompanied by a Certificate of Authenticity that can be verified online. Prints are of the highest quality. For more information, please visit the Fine Art Prints page. For something truly unique, contact me to discuss commissioning a custom, one-of-a-kind abstract piece for your client's home or office. Download a set of images to use when preparing your design concept to present to clients. I’d love to hear from you to discuss your design projects and answer any questions you may have.